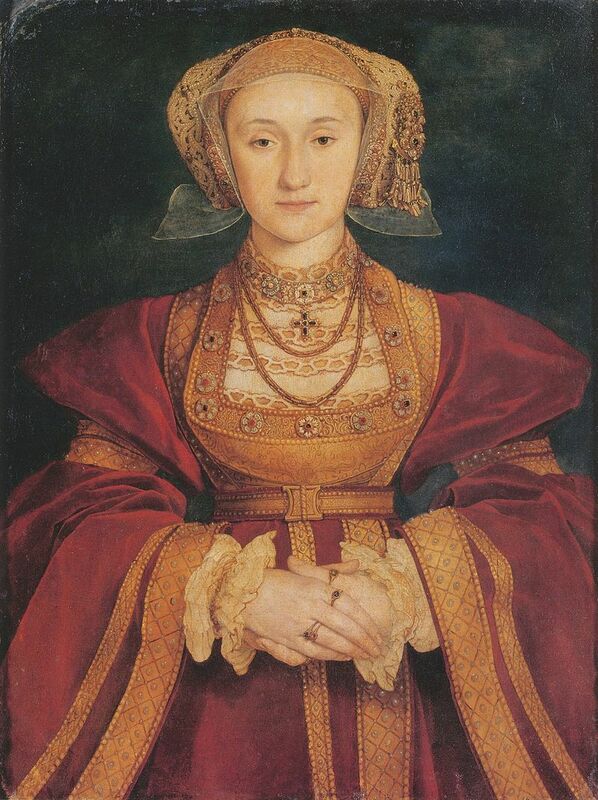 Today is the birthday (1515) of Anne of Cleves (Anna von Kleve), fourth wife of Henry VIII of England. The marriage was declared unconsummated and, as a result, she was not crowned queen consort. Following the annulment, she was given a generous settlement by the King, and thereafter referred to as the King’s Beloved Sister. She lived to see the coronation of Queen Mary I, outliving the rest of Henry’s wives. Anne has suffered in popular history as the “Mare of Flanders” and is often characterized as so ugly that Henry got rid of her as soon as he could once he actually laid eyes on her. Like all popular history, this tale needs correcting. Anne was born in Düsseldorf, the second daughter of John III of the House of La Marck, Duke of Jülich jure uxoris, Cleves, Berg jure uxoris, Count of Mark, also known as de la Marck and Ravensberg jure uxoris (often referred to as Duke of Cleves), and his wife Maria, Duchess of Julich-Berg (1491–1543). She grew up living in Schloss Burg on the edge of Solingen. Anne’s father was influenced by Erasmus and followed a moderate path within the Reformation. He sided with the Schmalkaldic League and opposed Emperor Charles V. After John’s death, Anne’s brother William became Duke of Jülich-Cleves-Berg, bearing the promising epithet “The Rich”. In 1526, her elder sister Sibylle was married to John Frederick, Elector of Saxony, head of the Protestant Confederation of Germany and considered the “Champion of the Reformation”. At the age of 11 (1527), Anne was betrothed to Francis, son and heir of the Duke of Lorraine while he was only 10. Thus, the betrothal was considered unofficial and was cancelled in 1535. Her brother William was a Lutheran, but the family was unaligned religiously, with her mother described as a strict Catholic. The duke’s ongoing dispute over Gelderland with emperor Charles V made them suitable allies for England’s Henry VIII in the wake of the Truce of Nice. The match with Anne was urged on the king by his chief minister, Thomas Cromwell. The artist Hans Holbein the Younger was dispatched to Duren to paint portraits of Anne and her younger sister, Amalia, each of whom Henry was considering as his fourth wife. Henry required the artist to be as accurate as possible, not to flatter the sisters. The two versions of Holbein’s portrait are in the Musée du Louvre in Paris and the Victoria and Albert Museum in London. Another 1539 portrait, by the school of Barthel Bruyn the Elder, is in the collection of Trinity College, Cambridge. Henry might have wished photography had been invented, but he would have been mistaken. Photography can mislead every bit as much as oil painting. From these paintings, Anne seems to look much like Henry’s other wives, maybe even prettier than some. But who knows what she was like in the flesh? Furthermore, attractiveness has as much to do with manner as with physical appearance, and there may have lain the issue for Henry. Negotiations with Cleves were in full swing by March 1539. Cromwell oversaw the talks and a marriage treaty was signed on 4th October of that year. Henry valued education and cultural sophistication in women, but Anne lacked these. She had received no formal education but was skilled in needlework and liked playing card games. She could read and write, but only in German. 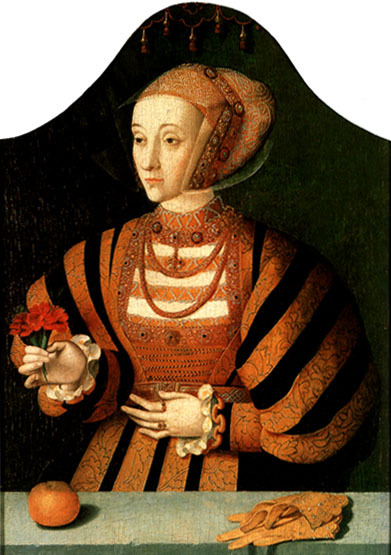 Nevertheless, Anne was considered gentle and virtuous, as well as being easily manipulated, which seemed to make her a suitable candidate for Henry. [The King] so went up into the chamber where the said Lady Anne was looking out of a window to see the bull-baiting which was going on in the courtyard, and suddenly he embraced and kissed her, and showed her a token which the king had sent her for New Year’s gift, and she being abashed and not knowing who it was thanked him, and so he spoke with her. But she regarded him little, but always looked out the window…. and when the king saw that she took so little notice of his coming he went into another chamber and took off his cloak and came in again in a coat of purple velvet. And when the lords and knights saw his grace they did him reverence. Although Anne reportedly “regarded him little” it is unknown if she knew this was the king or not. Henry did reveal his true identity to Anne at the time, although he is said to have been soured on the marriage from then on. Henry and Anne met officially on 3rd January on Blackheath outside the gates of Greenwich Park, where a grand reception was laid out. Most historians believe that he later used Anne’s alleged unattractiveness and failure to inspire him to consummate the marriage as excuses, saying he felt he had been misled: “She is nothing so fair as she hath been reported”, he complained. 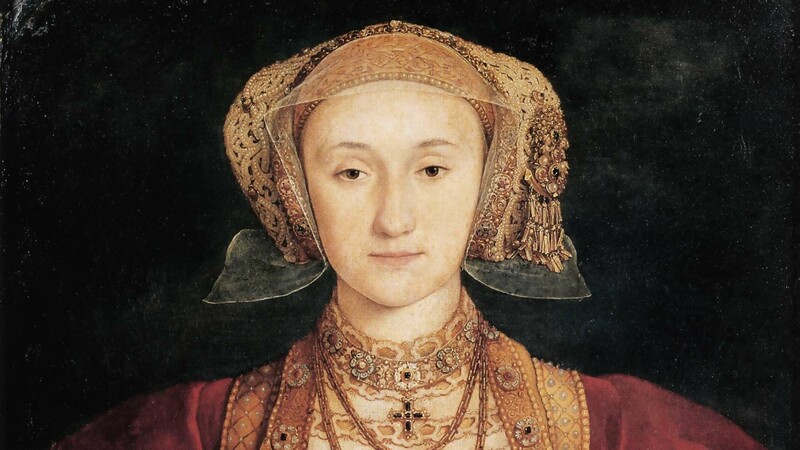 Cromwell received some of the blame for the portrait by Holbein which Henry believed had not been an accurate representation of Anne and for some of the exaggerated reports of her beauty. The marriage was never consummated. Henry urged Cromwell to find a legal way to avoid the marriage but, by this point, doing so was impossible without endangering the vital alliance with the Germans. In his anger and frustration the king finally turned on Cromwell, who had been a loyal subordinate in all matters. Cromwell’s enemies, who had long waited for him to make his first false step, began to close in. Anne was commanded to leave the Court on 24th June, and on 6th July she was informed of her husband’s decision to reconsider the marriage. Witness statements were taken from a number of courtiers and two physicians registering the king’s disappointment at her appearance. Henry had also commented to Thomas Heneage and Anthony Denny that he could not believe she was a virgin. Shortly afterwards, Anne was asked for her consent to an annulment, to which she agreed. Cromwell, the moving force behind the marriage, was attainted for treason. The marriage was annulled on 9th July 1540, on the grounds of non-consummation and her pre-contract to Francis of Lorraine. Henry VIII’s physician stated that after the wedding night, Henry said he was not impotent because he experienced “duas pollutiones nocturnas in somno” (two nocturnal pollutions (ejaculations) while in sleep). On 28th July, Henry married his fifth wife, Catherine Howard. On the same day Thomas Cromwell was executed, in theory for treason, but in practice as a scapegoat for the doomed German marriage. 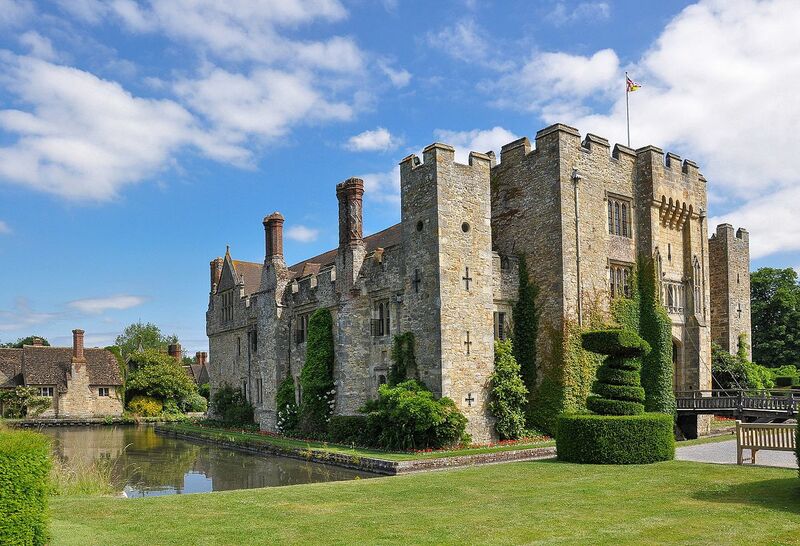 Anne, as former queen, received a generous settlement, including Richmond Palace, and Hever Castle, home of Henry’s former in-laws, the Boleyns. 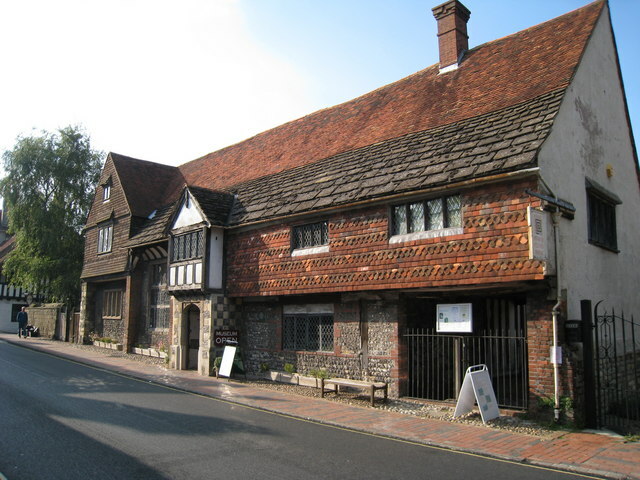 Anne of Cleves House, in Lewes, East Sussex, is just one of many properties she owned although she never lived there. Henry and Anne became good friends—she was an honorary member of the king’s family and was referred to as “the King’s Beloved Sister”. She was invited to court often and, out of gratitude for her not contesting the annulment, Henry decreed that she would be given precedence over all women in England save his own wife and daughters. 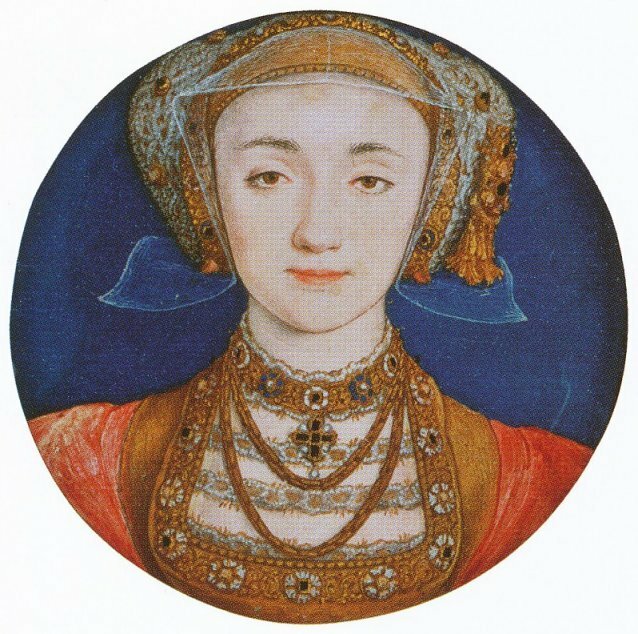 After Catherine Howard was beheaded, Anne and her brother, the Duke of Cleves, pressed the king to remarry Anne. Henry quickly refused to do so. Anne seems to have disliked Catherine Parr, and reportedly reacted to the news of Henry’s sixth marriage with the remark “Madam Parr is taking a great burden on herself.” In March 1547, Edward VI’s Privy Council asked Anne to move out of Bletchingley Palace, her usual residence, to Penshurst Place to make way for Thomas Cawarden, Master of Revels. They pointed out that Penshurst was nearer to Hever and the move had been Henry VIII’s will. 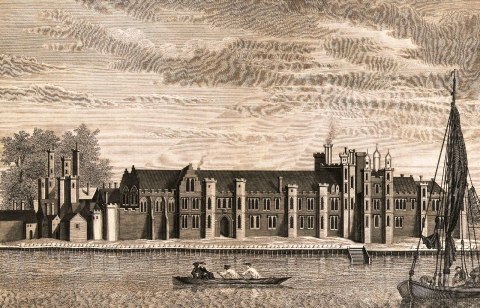 When Anne’s health began to fail, Mary allowed her to live at Chelsea Old Manor, where Henry’s last wife, Catherine Parr, had lived after her remarriage. Here, in the middle of July 1557, Anne dictated her last will. In it, she mentions her brother, sister, and sister-in-law, as well as the future queen Elizabeth, the duchess of Suffolk, and the countess of Arundel. She left some money to her servants and asked Mary and Elizabeth to employ them in their households. She was remembered by everyone who served her as a particularly generous and easy-going mistress. 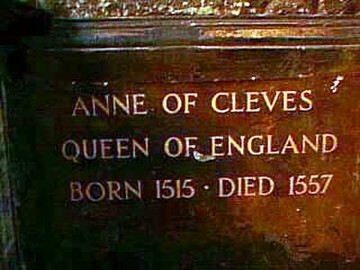 Anne died at Chelsea Old Manor on 16th July 1557, eight weeks before her forty-second birthday. The most likely cause of her death was cancer. She was buried in Westminster Abbey, on 3 August, in what has been described as a “somewhat hard to find tomb” on the opposite side of Edward the Confessor’s shrine and slightly above eye level for a person of average height. She is the only wife of Henry VIII to be buried in the Abbey. Anne has the distinction of being the last of Henry VIII’s wives to die, as she outlived Henry’s last wife, Catherine Parr, by 9 years. She was not the longest-lived, however, since Catherine of Aragon was 50 at the time of her death. 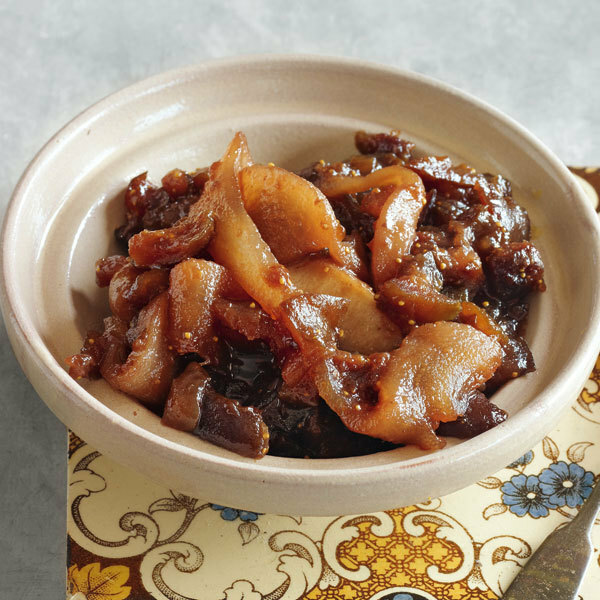 I’ve covered various Tudors in my posts over the years and accompanied the posts with English Tudor recipes which you may search for if you are so inclined. 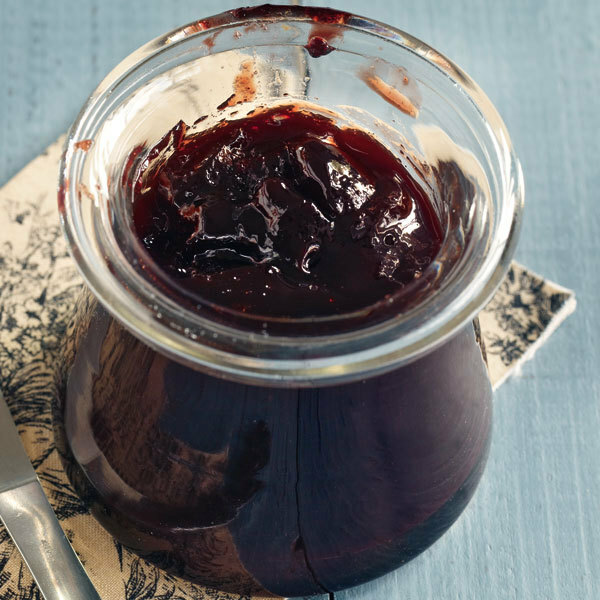 Instead I will take a look at apfelkraut which originated in the northern Rhineland, although these days it is an apple spread (above), much like the apple butter of the US. Originally it was a fermented mix of apples and cabbage, which was then cooked with other ingredients. I cannot claim that this recipe is close to the 16th century version, but it is complex and tasty, and makes a good accompaniment for meat. It is something of a rigmarole to make. You need to start at least 4 weeks before you plan to serve it. Begin this process at least 4 weeks, and up to 6 weeks before serving. Begin by making sauerkraut. Remove 2 or 3 of the tougher outer leaves from each cabbage and set them aside. Cut the cabbages in half and slice them very fine by hand or with a shredder or mandolin. In a large bowl, mix the cabbage with the salt, caraway and apples. Line a gallon ceramic crock with the outer cabbage leaves, saving a few to cover the top. Put in a quarter of the cabbage mixture and tamp it down with a heavy clean object like the bottom of a wine bottle. Repeat until all the cabbage is in. From the tamping, sufficient brine should be released to cover the cabbage. Cover the cabbage with the remaining leaves. The cabbage will swell while fermenting, so it should not reach all the way to the top. Lay a plastic bag or a cloth over the leaves. Cover with a plate and then a weight, such as a heavy can or jar of water, to keep the cabbage under the brine and out of the air. The cabbage will take anywhere from 2 to 6 weeks to ferment (below 75°F, 4 to 6 weeks; above 75°F, 2 to 3 weeks). Every few days, remove the scum from the top of the brine, replace the plastic bag or cloth, wash the plate and the rim of the crock, and return the plate and weight. When the bubbling stops, fermentation is complete. Cover the crock lightly and store in a cool (38°F) place, or refrigerate. Rinse the cabbage before using. Sauté the bacon in a dry skillet over medium-high heat until crisp. Remove the bacon from the pan and drain. Pour off all but 4 tablespoons fat. Add the onion and sauté over medium heat until translucent. Rinse the sauerkraut, drain well, and stir into the onion. Cover the pan and simmer 10 minutes. Add the apples, broth, wine, potatoes, vinegar and sugar. Return to the simmer and simmer gently until the apples and potatoes are tender but not mushy (10 to 20 minutes). Serve warm.